VOICE: "For the last six months… from New Orleans… to Rosemont .. to Omaha.. through Denver … all stops along the way as World’s Finest Wrestling: the New ERA heads to the final destination." VOICE: "Las Vegas, Nevada. Four championship belts." VOICE: "Who will survive the unification matches? Which of these men will walk out of the MGM Grand Garden Arena … as the WFW:NE PRODIGY© Classic Xtreme champion …. And which will walk out … as the WFW:NE World Heavyweight champion?" VOICE: "The time is growing nearer…. 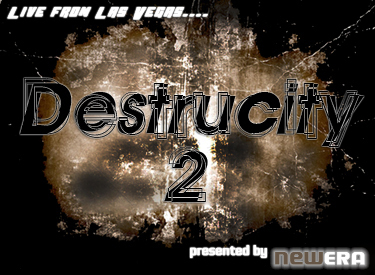 DESTRUCITY …. Is almost… upon us." NEWMAN: "No, no, Brandon. Dean and I are bundled up because in just a few moments we’ll be heading out into the freezing cold to call the Christmas Lot Brawl on the scene!" VOICE: "Many remember the nights in July of 2007 .. where Empire Pro … and New ERA of Wrestling put on a wrestling spectacular." VOICE: "Now .. Empire Pro and World’s Finest Wrestling: the New ERA … will go HEAD… to HEAD …." NEWMAN: "As I was saying, if you feel bad for us .. not only will it be twelve degrees out there, without the windchill factor … not only has it been snowing here lately … but there will be five WFW:NE superstars who will be wrestling in that environment!" 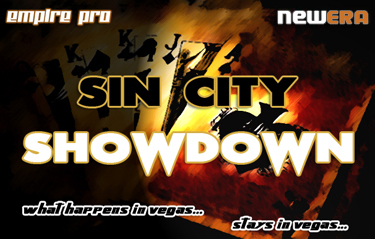 VOICE: "The Sin City Showdown … may the best hand win." JACOBS: "Did you see Jared Wells in the back? He looked like a caged animal ready to strike." MARX: "The BAD World Heavyweight Championship always motivated him and it represents a time when Wells was transformed into a main evener player who could battle against the very best WFW had to offer. I'd hate to be in Steve Johnson's shoes tonight." "NOT" WATERS: "Steve Johnson is a wrestler, he is young, but every bit as good as a Larry Tact or a Jean Rabesque and another win tonight over Wells would catapult him into the main event scene." MARX: "HAL really pissed him off at the last show more than I've seen in a long time by causing his early elimination in the Masquerade Ball Battle Royal." JACOBS: "He wanted to be in that Unification match at the PPV and he knew beating Shawn Hart was his way to get there and get another shot at Felix." "NOT" WATERS: "If there is anything Wells wants as much as the WFW:NE World Heavyweight Championship, it is the BAD World Heavyweight. He was the longest reigning champion of all-time and its history fits Jared Wells like a glove." MARX: "Steve Johnson told me earlier tonight that he is so sick of being considered the underdog in this match he is requesting that he is introduced first because everyone is treating him like the challenger and he wants to prove again that he is the rightful BAD World Heavyweight Champion going into his unification match with the P©X champion King Krusher at the PPV." JACOBS: "Well, he is more than going to have his chance, let’s send this one down to ringside..."
LINKS: "THIS IS A SANTA'S SACK O WEAPONS MATCH FOR THE BAD WORLD HEAVYWEIGHT CHAMPIONSHIP! Introducing first… Standing at six foot three and weighing in at 230 pounds …. Hailing from Columbus, Ohio … the MAN WHO ENDED THE CHAMPIONSHIPD REIGN OF JARED WELLS AND THE BAD WORLD HEAVYWEIGHT CHAMPION ……. STEVE …… JOHNSON!" LINKS: "And his opponent, the challenger, standing at 6'1, 254 pounds, a former member of LOVE, AND THE LONGEST REIGNING BAD WORLD HEAVYWEIGHT CHAMPION OF ALL-TIME.... JARED WELLS!" JACOBS: "JOHNSON DROPS HIS SACK AND HE CHARGES WELLS AS HE ENTERS THE RING WITH A FLURRY OF RIGHT HANDS!" MARX: "Wells still hasn't had a chance to take that sack off of his shoulders." "NOT" WATERS: "There is the bell finally!" JACOBS: "JOHNSON WHIPS WELLS OFF THE ROPES.... JOHNSON CHARGES WITH A LARIAT...."
"NOT" WATERS: "Johnson is going for the quick kill." JACOBS: "WELLS DUCKS UNDER THE LARIAT AND HE SWINGS THE SACK AND NAILS JOHNSON IN THE BACK OF THE HEAD, HE IS OUT COLD!" MARX: "What the hell was in that bag?" JACOBS: "Wells is reaching into the bag... WELLS DUMPS OUT A COUPLE OF BROKEN CINDER BLOCKS ONTO THE MAT... AND NOW HE IS PULLING OUT SOMETHING ELSE... IT IS THE OLD BAD WORLD HEAVYWEIGHT CHAMPIONSHIP THAT WAS GIVEN TO HIM WHEN LOST THE CHAMPIONSHIP AT THE SUPERBOWL OF WRESTLING!" "NOT" WATERS: "Management felt that after all his hard work, he deserved it." MARX: "Johnson may have a serious concussion after that blow to the head." JACOBS: "Wells is strapping the OLD BAD World Heavyweight Championship around his waist.... WELLS PICKS UP THE LIMP BODY OF STEVE JOHNSON... HE HITS HIM WITH THE RAGE BOMB! Wells hooks the leg and makes the cover! 1----------- 2------------- 3!" LINKS: "THE WINNER OF THE MATCH.... AND NEW BAD WORLD HEAVYWEIGHT CHAMPION FOR THE SECOND TIME…. JARED WELLS!" JACOBS: "WELLS CLIMBS THE TURNBUCKLE AND LIFTS THE CHAMPIONSHIP UP IN THE AIR AND THE CROWD IS GIVING HIM A HUGE OVATION!" MARX: "It looks like the paramedics are coming down to help Steve Johnson. He may be out for a while depending on how his tests go." "NOT" WATERS: "There is no shame in how he lost. He got nailed by a damn cinder block to the head, which is enough to kill a normal man." JACOBS: "Folks, we have to take a commercial break, but when we come back, Problem Child and Jason Payne will meet to determine who will be $50,000 richer and one half of the WFW:NE World Tag Team champions with Cameron Cruise, STAY TUNED!"